This tripod is designed to give a temporary and portable anchorage point to ensure safe access while working below ground. Manufac- tured from high strength alloy. Lanyards are designed to protect the user in a potential fall situation and arrest the fall. These are linked to the full body harness. The Dräger PP10 Escape Set Emer- gency Escape Set allows safe, effective and uncomplicated escape from hazardous environments where the maximum levels of protection are required. 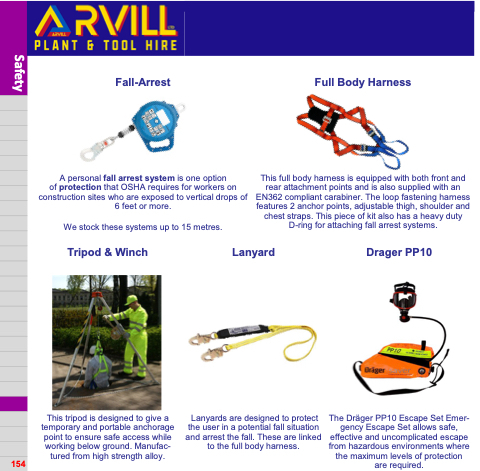 This full body harness is equipped with both front and rear attachment points and is also supplied with an EN362 compliant carabiner. The loop fastening harness features 2 anchor points, adjustable thigh, shoulder and chest straps. This piece of kit also has a heavy duty D-ring for attaching fall arrest systems. of protection that OSHA requires for workers on construction sites who are exposed to vertical drops of 6 feet or more. We stock these systems up to 15 metres.